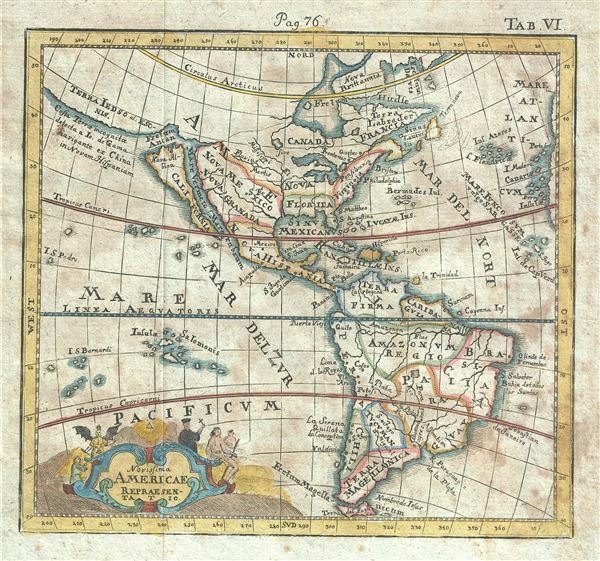 A scarce 1742 miniature map of America by German historian Benjamin Hederichs. This map covers the entirety of America from the Arctic Circle to Tierra del Fuego, including all of North and South America, as then known. The map perpetuates many of the cartographic moths of the era, including an insular California and beyond the mythic straits of Anian, Terre de Gamma or Terra Yedso. Baja California was subsequently discovered in 1533 by Fortun Ximenez, who had been sent to the area by Hernan Cortez. When Cortez himself traveled to Baja, he must have had Montalvo's novel in mind, for he immediately claimed the 'Island of California' for the Spanish King. By the late 16th and early 17th century ample evidence had been amassed, through explorations of the region by Francisco de Ulloa, Hernando de Alarcon and others, that California was in fact a peninsula. However, by this time other factors were in play. Francis Drake had sailed north and claimed 'New Albion' (identified here on the northwest coast of California Island) near modern day Washington or Vancouver for England. The Spanish thus needed to promote Cortez's claim on the 'Island of California' to preempt English claims on the western coast of North America. The significant influence of the Spanish crown on European cartographers caused a major resurgence of the Insular California theory. Just before this map was made Eusebio Kino, a Jesuit missionary, traveled overland from Mexico to California, proving conclusively the peninsularity of California. This is also one of the last maps to represent California as an Island. North of California a vast projection, labeled Terra Jedso, extends westward towards Asia , which it appears to join. Jedso was a term commonly used in the late 17th and 18th centuries to refer to Hokkaido or the unexplored lands north of Honshu. Wishful thinkers imagined that America may be connected to Asia and, presumed that, through the Pacific Northwest, a practical trade route to the wealthy markets of Asia might be established. In the heart of North America the Great Lakes are amalgamated into a single vase body of water which itself is unlabeled. The British Colonies are limited to a coastal rang where is here identified s Virginia. Decorative allegorical title cartouche in the lower left quadrant features catholic priests, indigenous peoples and winged angels. Published for Hederichs 1742 Anleitung zu den fürnehmsten historischen.